Edison was renowned as a famous inventor. It has been recognised that he is responsible for over 1000 patented inventions; the most famous most likely being the light bulb. However, his quest to make the common light bulb was not without problem! 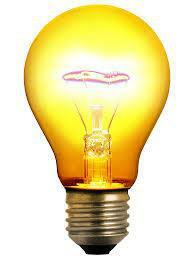 Originally, light bulbs worked by passing an electrical current through something called a filament. The electricity caused this material to heat up and glow. This was how the light was produced. The only problem was that the electrical current caused the filament to heat up so much that they burst into flames! Edison persevered and experimented with lots of different materials. He finally worked out that a metal called tungsten was most suitable owing to it's high melting point. He had tested over 2000 different materials and tasted failure each time... until this point. So, when things are going wrong or you come across an unexpected problem, persevere! Edison did!